I have teamed up with J's Reviews and Giveaways and Mizz Review Lady to bring you an awesome Farberware Food Processor Giveaway, perfect for the upcoming Holiday Dinners!! Complete all your Kitchen prep work without a fuss with an all-purpose food processor! 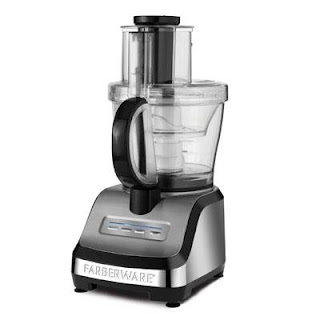 To learn more about this awesome Food Processor from Farberware, Check out J's Reviews and Giveaways Review. Here's the Fun Part!! One Lucky reader will win a Farberware Food Processor!! This giveaway is Open November 5th until November 19th 11:59 p.m Est!! To enter simply fill out some or all the rafflecopter Form below!! a Rafflecopter giveaway *Disclaimer- Mommy's Moments is not responsible for prize fulfillment. The Sponsor of this giveaway is shipping the winner the prize. (One Farberware Food Processor). I was not compensated in any way to post this giveaway on my site. I like the Hot Zone Griddle! I like the Convection Bread Machine with Handles. Russell Hobbs 1.8L tea Kettle... love that thing! I like the 1.8L red kettle! So cute! Thanks for the great giveaway! The 12 cup coffee and tea maker! Wow what a prize, just in time for Christmas. I would live to win this one. Good luck everyone. I also like the coffee and tea maker because I don't have one and a 12 cup is just the size I need.